The TRENCH'N edge is a gasoline powered trencher. It is designed to be pulled along a planned path at properly prepared worksite. Its purpose is to dig a shallow trench for use in residential and commercial landscape construction. The trench is dug 5" inches wide at a variable depth to 6" inches deep. Optional equipment can be installed to change the trench size to 2-1/2" inches wide with a variable depth to 7" deep. The trench is used for the placement of brick edging, plastic edging, lawn irrigation components, low-voltage landscape lighting, or footings for small landscaping walls. Never use the TRENCH'N edge for any use it is not intended or designed for. The engine controls are located on the engine. They consist of a fuel shutoff valve, choke, and throttle. The engine ON/OFF switch is located on the TRENCH'N edge handlebar. Always inspect the engine controls for proper operation. and never operate the TRENCH'N edge with defective or altered engine controls. The operator controls consist of the handlebar, the clutch control handle, the trenching arbor depth crank, and the reversible discharge chute. Always inspect the operator controls for proper operation and placement. Never operate the TRENCH'N edge with defective, missing, or altered operator controls. Handlebar: The handlebar is used to steer and pull the TRENCH'N edge along a planned and properly prepared route. Mounted on the handlebar is the engine ON/OFF switch. Unless it is an emergency, always slow the engine to an idle before turning the engine ON/OFF switch to off. For safety reasons, never pull the TRENCH'N edge up hill. 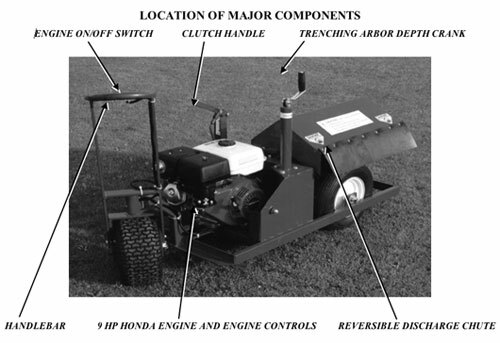 Trenching Arbor Depth Control Crank: Turning the crank will lower the trenching arbor to the desired depth of cut. When starting the engine, the trenching arbor should always be in the fully raised position. When engaging the clutch, the trenching arbor should be in the raised position. Never lower the trenching arbor when the machine is positioned over hard surfaces (concrete, asphalt, driveways, sidewalks, etc.). Damage can occur to the cutting teeth. and Possible Damage to the TRENCH'N edge, never lower the trenching arbor depth control when the machine is positioned over a hard surface. Reversible Discharge Chute: The discharge chute can be positioned to direct the discharge of trenched material to either the right or left side of the machine. To change the direction of discharge, loosen the hardware retaining the chute, turn the chute around to face the other side, and securely reattach to the machine. When the discharge chute is removed from the machine, the trenching arbor and cutting teeth are exposed. Do Not Remove the Discharge Chute With the Engine Running or the Trenching Arbor Clutch Engaged.